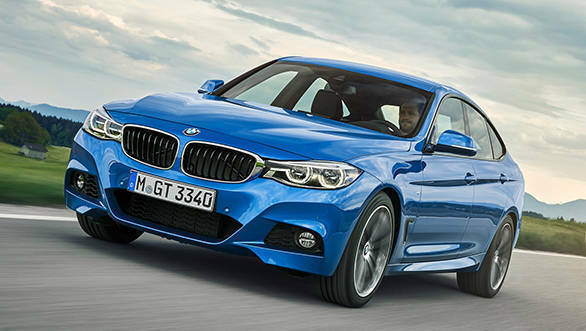 BMW has brought the 330i Gran Turismo M Sport to India. The new offering is not an-all new car as last year, BMW had already launched the 3 Series GT in the country. The BMW 330i Gran Turismo M Sport is priced at Rs 49.40 lakh, making it Rs 6.10 lakh more premium than the launch price of the standard model. The M Sport package adds sporting character, impressive performance and appealing design, states Vikram Pawah, president, BMW Group India. The 2017 BMW 330i Gran Turismo M Sport gets black high-gloss radiator grille. It gets a M aerodynamic package with 18-inch M star spoke alloy wheels along with M badging on the front side panels. The tail pipes too get a distinct chrome finish. In addition to the sporty exterior, the Gran Turismo M Sport also gets a special key with M strip, M door sill finishers and other features with the sporty M badging. The diesel variants (320d) of the 3 Series GT are powered by a 2-litre motor that churns 190PS at 4,000rpm and makes 400Nm at 1,750-2,500rpm. Mated to this motor is an 8-speed automatic transmission. The BMW 330i Gran Turismo M Sport draws power from a 252PS/350 Nm two- litre four cylinder petrol engine. This unit too is mated to a 8-speed automatic transmission. BMW claims that car can accelerate from 0 -100 kmph in just 6.1 seconds and deliver an overall efficiency of 15.34 kmpl. In terms of safety, the BMW 330i Gran Turismo M Sport comes with six air bags, ABS with brake assist, dynamic stability control including dynamic traction control, cornering brake control, side-impact protection, ISOFIX child seat mounting, runflat tyres with reinforced sidewalls, emergency spare wheel, electronic vehicle immobiliser and crash sensor.